In this Casio Privia PX-S1000 review we’ll cover all the amazing features this digital piano offers like Bluetooth, battery power, and much more. If you’ve got your fingers on the pulse of instrumental innovation, you might already be aware of Casio’s latest release - the Privia PX-S1000. 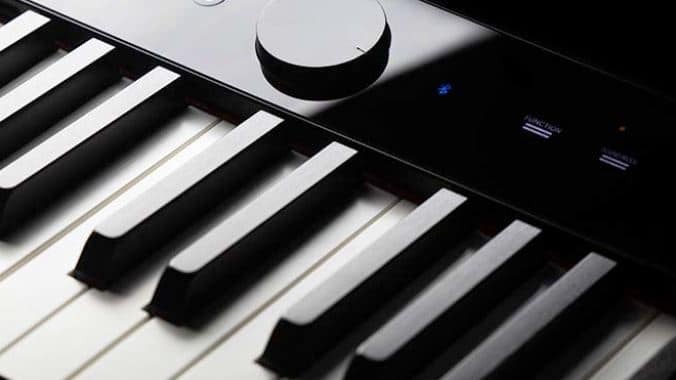 It's the latest addition to Casio’s digital piano line - and a lot of people are hunting for informative reviews in the wake of the piano’s very recent release to inform their purchase. And if this piano strikes you as a good buy, you’ll be happy to know that your instinct serves you well. Let's break it all down in this Casio Privia PX-S1000 review. If you’re in the market for a compact, feature-filled digital piano in an affordable price range, I might be able to save you some time shopping around - You can’t go wrong with the Privia PX-S1000. I'm usually a bit more tentative with my recommendations, as different instruments can offer different features that might be better for an individual versus another brand or model - but the Privia is arguably the best option on the market for those looking for a lightweight, portable piano without sacrifice. Looking in detail at Casio’s latest release, it doesn’t feel like a stretch at all to say that the Privia PX-S100 is the best digital piano for your money on the market today. But I’ll get down to all the specifics below. The newest addition to the Casio family is visually striking from the first glance, and luckily, the good news doesn’t stop there. Casio touts the Privia PX-S100 as the slimmest digital piano on the market - bar none. If you want a slimmer digital piano, I’m afraid you’d have to build one yourself. It’s entirely possible to carry it around to shows or performances under one arm - something that I wouldn’t have thought possible for a quality piano even as much as 4 or 5 years ago. Personally, as the owner of an absolute dinosaur of a Casio myself, it’s refreshing to see such a huge step forward for portability and ease of use. 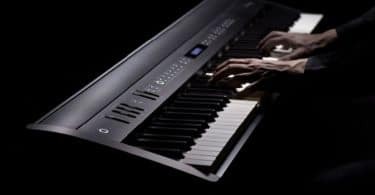 In the most basic of descriptions, Casio’s new Privia PX-S1000 is the thinnest 88 hammer-action key electronic piano with built-in speakers on the market today. But that description falls fairly flat, considering everything else that the S1000 can do with such a small footprint. First off, the Privia is an instrument that has truly embraced the times - the piano comes standard with Bluetooth connectivity, and interfaces with the Chordana app from Casio seamlessly. You can change settings from your phone or tablet, and most devices sit nicely on the included music stand. Personally, as the owner of an increasingly hefty and disorganized binder of sheet music - it’s a rather welcome change. You can play along with songs, follow along with lessons, and generally just take some headache out of managing your resources as a player, whether you play for just fun, or perform professionally. And, as an additional bonus, the piano can accept Bluetooth connections to simply play tunes out of the speakers on the piano - which blow most Bluetooth speakers out of the water. If you haven’t got a Bluetooth capable device (Like an iPhone, iPad, or Android phone) don’t fret - if you want to take advantage of the Privia’s Bluetooth features without breaking the bank, there are a lot of cheap Android tablets out there, and Chordana is on the Google Play store. This is something I’m personally pretty excited about - the PX-S100 has the option to run on battery power, instead of using a wall adapter. And, rather than use rechargeable batteries that replenish when plugged in, Casio has instead opted for standard AA alkaline batteries. In fact, Casio recommends NOT using rechargeable batteries with this piano at all. And, since I’m a bit of a battery nerd, allow me to sell you on why that is actually a good thing - for one, most rechargeable batteries (commonly lithium-ion or lithium-polymer) don’t tend to hold up very well in applications where they’re plugged in to a power source most of the time. That’s why a lot of older laptops actually recommend removing the battery if you’re going to use it plugged in for weeks on end - batteries like to charge and discharge regularly. Secondly, they’re more expensive - a lithium battery pack could feasibly add on 40 to 80 dollars to the asking price. On top of that, integrated batteries typically aren’t designed to be replaced (and if they are, they’re usually pretty pricey). You’d start to see a decline in runtime in 2 to 3 years, and after 5 or 6 years, you’d be lucky if it lasted 20 minutes unplugged. Alkaline batteries are cheap and plentiful - and you can carry spares with you if you plan to play all day. The Privia PX-S100 takes 6 AA batteries in total to run. But remember, don't use rechargable batteries! Just regular AA will do. Casio has a listed run time of 4 hours on their website, and after poking around online, the average does indeed seems to be 4 to 5 hours of playtime Given the size of the speakers and the touch display, that is honestly pretty solid. The sound design of the S1000 is also top notch - I’ve seen some very well designed speakers from brands like Yamaha and Korg, and I’m happy to say that Casio’s Privia is a solid contender for sound quality and design. It doesn’t leave you wanting anything in terms of sound quality or playback modes, and it even has some useful options for modulation, like the emulation of concert hall acoustics - the Privia has 6 sound modes, 4 for halls and 2 for surround sound. Another very nice design consideration by Casio is the inclusion of omni-directional sound projection. The speaker grills are subtle while still remaining effective for projecting sound. The way that the Privia PX-S100 is designed allows it to project sound back at the pianist without interfering with performance. Casio claims that the speakers are engineered to sound accurate in a variety of spaces, be it facing a wall, resting on a table, or in an entirely open performance space. And while I haven’t gotten the chance to personally test out the Privia in a huge number of spaces, the reviews seem to support claims of the Privia’s flexibility very well. The nuts and bolts of the S1000’s musical chops are good - the hardware and sound delivery is exactly what you’d want from a quality piano in the price range, with a broad range of touch sensitivity for a digital piano, robust speakers for sound projection, and 18 included tones. For additional icing on the proverbial cake, the PX-S1000 offers whopping 192 notes of polyphony - (If you’re unfamiliar with the term, I touch on concept of polyphony in this article on Yamaha’s Arius YDP-184). Given the size and portability of this model, it’s a very impressive amount of polyphony - I don’t think any competing brands offer anything quite like the S1000. At first glance, the two Privia models might seem like twins. Don’t get me wrong, they are very similar - both pianos have an almost identical size footprint, they both are electronic pianos with 88 hammer-action keys, they both offer Bluetooth connectivity, they both offer Bluetooth support for the Chordana app, et cetera, et cetera. But there’s a good reason the PX-S3000 sports a higher price tag - it’s packed to the gills with features. The S1000 is no slouch by any means, but the S3000 is a veritable swiss army knife for an advanced pianist. Where the Privia PX-S1000 offers a respectable 18 tones, which is a common range of sounds for most digital pianos in its weight class - the S3000 offers an absolutely staggering 700 tones. That’s not a typo, I promise- The S3000 offers almost 40 times the amount of tones when compared to its little brother in the Privia line, and the showing off doesn’t stop there. The PX-S3000 offers song and audio recording and playback, with a track capacity of approximately 30,0000 notes. It’s got a pitch bend wheel, music presets, auto-harmonize, an incredibly robust arpeggiator, the list goes on. If you’re reading these features with a confused look or wondering what they would do for you, then honestly - you probably don’t need them! If you’re not a fan of all the extra bells and whistles, the S1000 is still a fantastic buy - but if you’re a bit more into the advanced options that digital pianos can offer, the S3000 is a smart upgrade. The Roland FP-30 (big brother to the Roland FP-10, which you may remember from here) and the Yamaha P-125 are two of Casio’s contenders in the lightweight digital piano arena. The Roland FP-30 and Yamaha P-125 fill the same need as the Privia PX-S1000, but honestly don’t quite stack up to the Privia line well enough to give it a run for its money. Sure, all are 88-key pianos, and I wouldn’t go so far as to say any of them are large or unwieldy - but both the FP-30 is two inches thicker and nearly 4 inches deeper than the Privia. Yamaha’s P-125 is almost 3 inches thicker, and 2 inches deeper. The dimensions aren’t everything, but if you’re looking for a portable piano, then they are definitely something you want to take into consideration. And while we’re talking portability, the P-125 weighs a couple pounds more than the Privia - which clocks in at just under 25 pounds, and the FP-30 weighs in at a whopping 31. And that’s not the worst part - for the additional weight and bulk of the two main competitors, they still don’t outperform the Privia in any significant way. They both have smaller speakers that don’t deliver as much sound, and their speaker amplifiers are weaker as well - so they’ll fall short in both quality and quantity of sound. The FP-30 doesn’t have the polyphony range of the Casio, and Yamaha’s P-125 has half of the touch sensitivity. What really seals the deal for me personally is that neither competing model can run on battery power. And the final nail in the coffin is price. There’s an obvious case to be made for a piano with less features, weaker speakers, et cetera - when you’re a pianist on a budget. Not everyone can afford the piano that is the best at what it does on the market, and that’s understandable. But after scoping out the price ranges of the three models, almost every major retailer lists them at the same price - if you can by the FP-30 or the P-125, then you can buy the S1000. And quite frankly, there is no reason not to buy Casio’s S1000. To wrap up the article, I’d like to sum up the essence of what reviews and specs seem to support - the PX-S1000 (link to it on Amazon here) is the most bang for your buck that you’re likely to find for the next few years. It is - and it’s not often you get to say this and be right - the slimmest digital piano in the world. And even on top of that, it’s a great buy. Casio offers some optional accessories on their site, but I recommend checking out our article here for some well researched buys.